Last night, the County Board held its annual Organizational Meeting. As expected, we unanimously elected Katie Cristol to serve as our chair and Christian Dorsey to serve as our vice chair this year. We also welcomed our newest colleague, Erik Gutshall, to the Board table for the first time. I was happy to congratulate Katie and Christian on their leadership elections and Erik on joining the Board; and to welcome back fellow returning member John Vihstadt. A summary of my remarks is below. 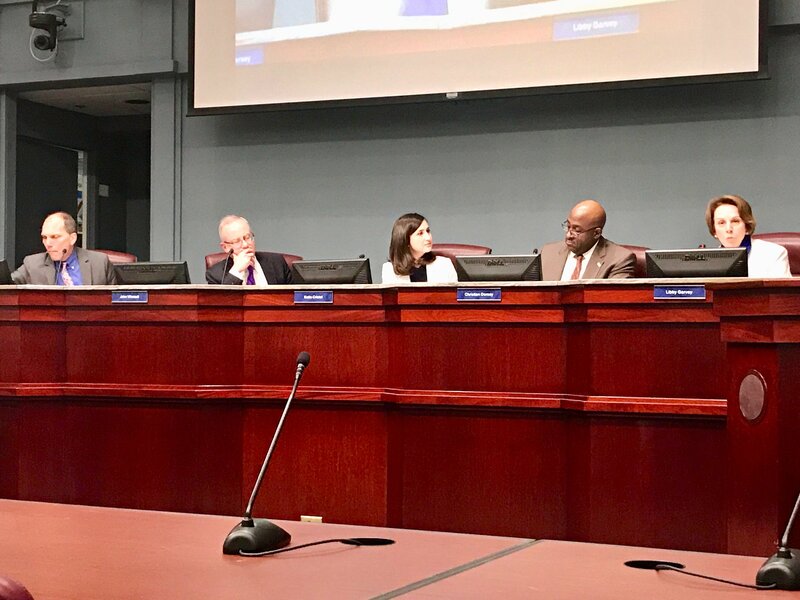 You can read my full remarks, or watch a recording of the meeting including all five of our statements on the Arlington County website. I talked a lot about teamwork because if we get the teamwork right, everything else will fall into place. The better we work together as a Board and as a community, the closer we will come to reaching our potential. I really look forward to this year because I think we have a great team to address the challenges we will face. After our organizational meeting, we had a reception and then met with the Civic Federation as we did last year. We made brief general statements about how we might provide good services yet cut costs, and then answered questions. If you watch the meeting, I think the collegiality of our new Board is clear. This way of beginning the year with the Civic Federation is becoming a tradition, and I think it is a good one. I’ll write another post summarizing our regular meeting later this month, and will continue with monthly updates throughout the year. As always, I welcome feedback, both compliments and suggestions for improvement. I really want these posts to be helpful for you: informative, but easily readable. We have many blessings to count this January, and, as always, we have challenges. Our first challenge is becoming a solid Board team, but I am sure that we will meet it. All five of us bring different experiences, skills, abilities, and perspectives, and that is a great foundation for any team. I am delighted that so many of us are focusing on communication with the people we serve. This is another challenge we have, and we all realize we have work to do. Our new Communications team worked on providing smaller and more intimate settings for discussions to complement the traditional large forums and work groups. I plan to continue my series of book discussions as part of this effort. We still need to do a better job setting the context for our discussions. Those of us who work in government can easily forget that, for the people affected by any particular plan or playground or childcare center, it may be the first time they’ve ever really thought about local government, or had any contact with us beyond paying taxes. As part of the effort to improve our public dialog, we’ve posted a draft guide on Civic Engagement. I encourage folks to check it out and to comment. Clear and consistent methods to foster public dialog should help us all shed more light and less heat on the issues before us, and thereby increase the effectiveness of our conversations. We will continue to work on improving our customer service; we still have a long way to go in some areas. This is another challenge. Last year at this time I said that I looked forward to being able to say soon that you could pay for permits online. Well, soon has come and gone, but you STILL cannot pay for permits online. I understand that in just a few more months, we will have this most basic of services available. Good government is all about our Board and our community working together as effectively possible because if we do that, I know everything else will fall into place. I think of Arlington as one big team: we want to maximize our strengths and minimize our weaknesses. But, looking at where we’ve been and who we are, I’m confident we have the resources we need and, most importantly, I think we have the political will, too. It is going to be a year of challenges, but also a year of opportunities. It’s going to be exciting and, dare I say it…fun. I look forward to working with everyone to build a better and better Arlington.